So now that you have got a new home, it is the perfect time to invite your guests for a celebration. 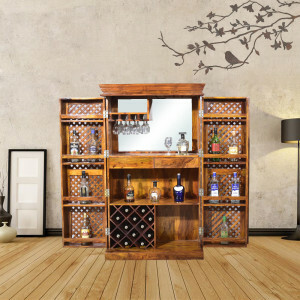 Choose from a wide range of home bar designs to give that extra edge to your home interior. A high quality bar cabinet not just enhances the overall aesthetic value of your interior, but it is also the best storage solution for your glasses, wine bottles, cutlery sets and bar utility items. The overall functionality of a bar furniture cannot be disregarded in any modern household set up. 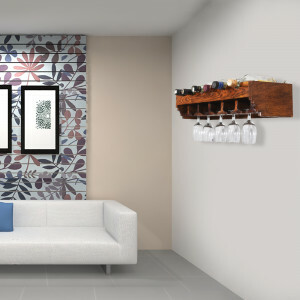 There are many bar unit designs for flats available in the market, and you can also choose a wooden bar as per your need. If you want to choose something in durable finish, texture and coating, then you can choose a corner bar cabinet in intricate Rajasthani Shekhawati designs, or one that is made of Sheesham wood. To add more glamour and class to your dining or drawing room, you can make a separate wooden partition, and install a wooden bar cabinet with both wood and brass combination. This will make the whole bar-setting arrangement look gorgeous, and your guests will compliment you on your aesthetic taste. 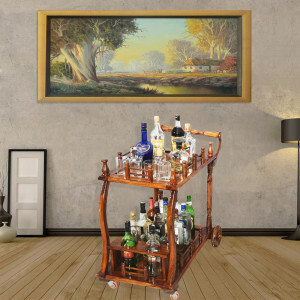 Whether you are inclined to buy a bar trolley on which you can keep your drinks, and the ice bucket, or else, if you are interested to buy a set of home bar furniture, you can now choose the sets easily from online portals. 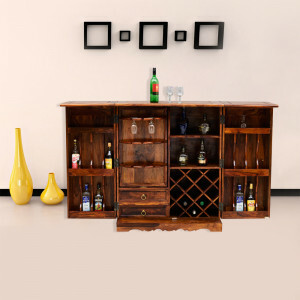 Bar cabinets online India provides you a plethora of options to choose from brass and wooden bar trolleys and other types of home bar furniture like wall-mounted bar cabinets, glass counters, wooden hanging racks and many more. The designs display elegance, simplicity and style in all their best forms. 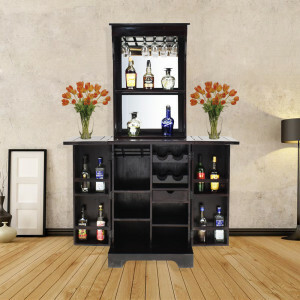 Buying a mini bar cabinet for your home, has now become quite easy. With the right customization option for your home bars, you do not have to worry about the installation and the price policies. 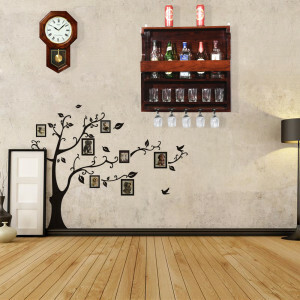 You can easily get both classy and contemporary bar designs at home. Whether you want a crisscross patti design or a simple wooden bar chair, at Naveen Arts you find a plethora of wooden furniture online like bar chairs, trolleys along with bedroom furniture, wooden chairs, sideboard, dining set, tv units and supreme quality wooden accessories.